All students must complete 30 credits of graduate coursework. Up to�10 graduate credits may be transferred from other institutions, if approved by the program director. Graduate courses offered outside the program may be taken for graduate credit, but only if approved by the graduate faculty. There are two plans leading to completion. 2. Thesis/Research Credit. Up to 6 credits may be taken in the Independent Study research courses (56:160:619,620 or 56:115:619,620). Up to 6 credits may be taken in preparing a research thesis (56:160:701,702 or 56:115:701,702).� Only a maximum of 10 combined credits of independent study and research can be counted toward Plan A. 3. Research Seminar. All students must accumulate at least 2 credits of 56:160:601,602. Full-time students are encouraged to register for seminar whenever it is offered. Full-time students are required to present during seminar at least once a year in the form of: (i) proposal of thesis topic; (ii) research results; or (iii) thesis defense. Full-time graduate students are expected to attend all departmental seminars. 4.�Faculty Adviser and Committee. All students are urged to find a faculty adviser (by mutual consent) before the start of their second semester, usually one who specializes in their areas of interest. Two other individuals will be appointed to form the student's committee. The committee oversees the selection of a research project, judges the acceptability of the thesis, and conducts the final examination. 5. Research Initiation. When a student is ready to begin a research project, an outline of the proposed topic is presented during seminar to the graduate faculty for approval. The deadline is mid-semester of the student's second term as a full-time student (generally prior to spring break). The student is expected to inform members of the student's committee of the date and time of the research proposal. At the end of each semester following approval of the research proposal, the student prepares a short (two- or three-page) written progress report for the research director. The report is circulated to other committee members for their information and becomes part of the student's file. A meeting is scheduled between the student and the committee at the start of the last academic year to ensure that the student is on track for degree completion. 6. Completed Thesis. The thesis must be approved by the director of the student's research committee and then accepted by the other committee members. The committee members have two weeks to review the thesis before the oral exam. For May graduation, the oral presentation and exam must be completed by mid-April. The thesis must be submitted online via the Electronic Theses and Dissertations (ETD) system: https://etd.libraries.rutgers.edu/login.php. The thesis deadline adheres to the same deadline as the Application for Admission to Candidacy for Degree. This can be found by visiting https://graduateschool.camden.rutgers.edu/files/Application-for-Admission-to-Candidacy-for-Degree.pdf. 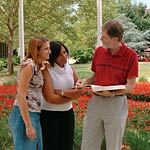 Students should be sure to follow the guidelines set forth in the Thesis and Dissertation Style Guide, which can be found at http://dept.camden.rutgers.edu/graduate-school/files/Thesis-Style-Guide.pdf. 7. Final Examination (Thesis Defense). See instructions below. Students completing the nonthesis option are required to complete 27 lecture credits, 1 seminar credit (final semester), and 2 credits of independent study (56:160:619,620 or 56:115:619,620).� All students must give an oral presentation (seminar) as the culmination of their degree work. 1. Faculty Adviser. All students are urged to find a faculty adviser (by mutual consent) before the start of their final semester, usually one who specializes in their areas of interest. The independent study credits should be taken after the 27 lecture credits have been completed. The student must inform the graduate director of the selection of the topic of the independent study research paper and adviser. 2. Independent Study Credits.�Two credits of independent study (56:160:619,620 or 56:115:619,620)�are taken under the supervision of a faculty adviser. Independent study credits are not counted as lecture-course credits unless special permission has been granted by the graduate faculty. 3. Research Seminar. Part-time students are encouraged to take seminar (56:160:601,602), but only 1 credit will be accepted toward the 30 degree credits. Seminar�must be taken during the final semester in which the student will be presenting the summary of their independent study research paper. 4. Final Examination. See instructions below. In both programs, students are expected to complete a final comprehensive examination. The final comprehensive examination is administered by the graduate faculty. The examination normally is taken during the semester in which the student completed his or her course of study. It includes a thesis defense for students in Plan A. This exam is at least one hour in length and begins with a presentation (open to the public and possibly scheduled as a research seminar) of his or her�thesis (Plan A) or research paper (Plan B). The candidate is responsible for publicizing the seminar and scheduling an appropriate seminar room. A diploma application must be submitted online in accordance with the deadlines that can be found at https://graduateschool.camden.rutgers.edu/graduation. The Application for Admission to Candidacy for Degree (side one) should be completed by the candidate and submitted to the graduate director prior to the examination. Application forms are available at https://graduateschool.camden.rutgers.edu/files/Application-for-Admission-to-Candidacy-for-Degree.pdf. The student must inform the graduate director of the intent to complete the final examination. The examination must be completed in accordance with the schedule established by the Office of the Dean of the Graduate School-Camden and the chemistry program. In the event of an unfavorable decision, the examination may be repeated twice. All teaching assistants are required to take at least 6 graduate credits (other than their teaching assistantship) each semester. Teaching assistants get 6 E-credits (56:160:877) per semester. Teaching assistantships are limited to two-years in duration.